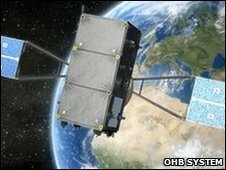 A space centre will be built in Oxfordshire as part of the new UK Space Agency (UKSA), the government has announced. The International Space Innovation Centre (ISIC) in Harwell will cost £40m and will be alongside the European Space Agency research facility. Some £24m will come from government with the rest from industry. The UKSA, which comes into being on 1 April, will take responsibility for government space policy and budgets. It will also represent Britain on space matters in all negotiations with international partners. The ISIC will use data from satellites, partly to understand and counter climate change, and advise on the security of space systems. It will create 700 jobs over the next five years. The government claims the space and satellite industry supports 68,000 jobs in the UK directly and indirectly, as well as contributing £6bn to the economy. By 2030 it wants this to grow to £40bn a year and create 100,000 jobs.